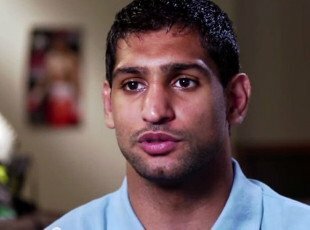 Amir Khan (30-3, 19 KOs) is drawing a line in the sand with unbeaten Floyd Mayweather Jr (47-0, 26 KOs) by giving him a hard 5-day deadline for him to make up his mind whether he wants to fight him next or not. If Mayweather doesn’t choose to fight Khan in the next five days, Khan will move on presumably. Khan didn’t say whether he would change his mind after the 5-day limit, but you can assume that the so-called limit wouldn’t keep Khan from still taking the fight. What’s interesting here is that Mayweather has made no mention of wanting to fight Khan. That’s weird part. Khan has been keeping himself waiting all this time as if Mayweather was telling him to stay on stand by while he worked out negotiations with Manny Pacquiao. Mayweather hasn’t said anything about wanting to fight Khan, and it just seems very strange that Khan has been holding back with looking for his next opponent when it seems pretty clear that Mayweather has zero interest in fighting him. Mayweather didn’t say anything about Khan’s win over Devon Alexander, but I wouldn’t be surprised if Mayweather was looking for a bigger name than that from Khan. Beating Alexander is technically a fight where Khan is fighting a top guy, but that obviously wasn’t a big enough move for Khan to get the Mayweather fight, especially given that Alexander had recently been beaten badly by Shawn Porter. Khan didn’t take much of a risk by facing Alexander, because the guy couldn’t punch and he’d already been beaten by Porter and Tim Bradley. The guys Khan likely needed to fight in order to get a bout against Mayweather are Keith Thurman and Kell Brook, but Khan hasn’t shown much interest in fighting them. Khan might not know this but by playing tough with Mayweather in giving him a 5-day deadline, he’s pretty much ensuring that he won’t get the fight. Guys who give deadlines are A-side fighters, and Khan would be the clear B-side or even C-side if he were to fight Mayweather. That’s why it seems so strange that Khan is giving Mayweather a deadline. Khan seems to be detached from the reality of the situation by giving a star like Mayweather a five-day deadline.